So, It is that time of year again, and by that time I mean anywhere between November and March when the trout are in the river. 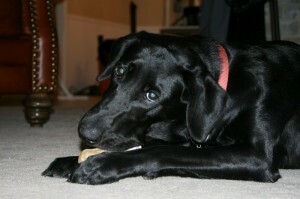 This was our first trip down in 2011, and our first trip down on a weekend in a while. It wasn’t as packed as we thought it was going to be, and not near as many TU’ers. 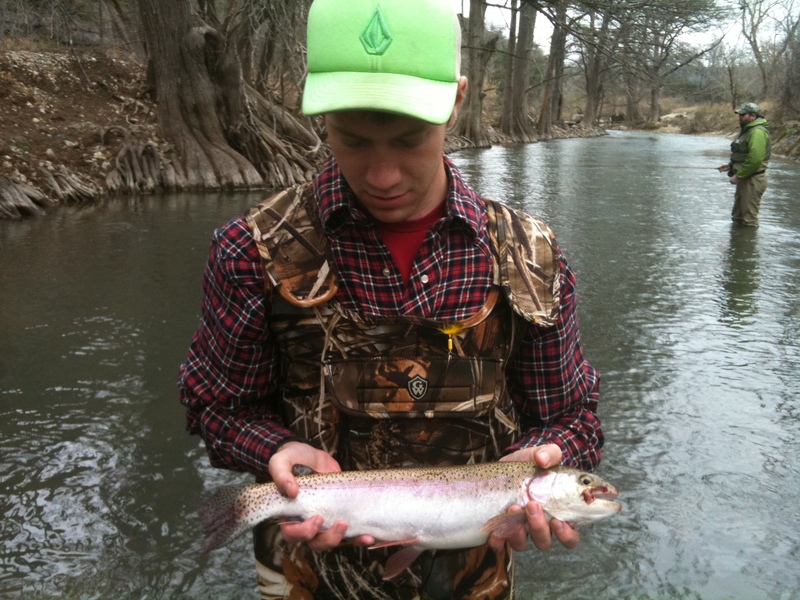 (Trout Unlimited lease members). 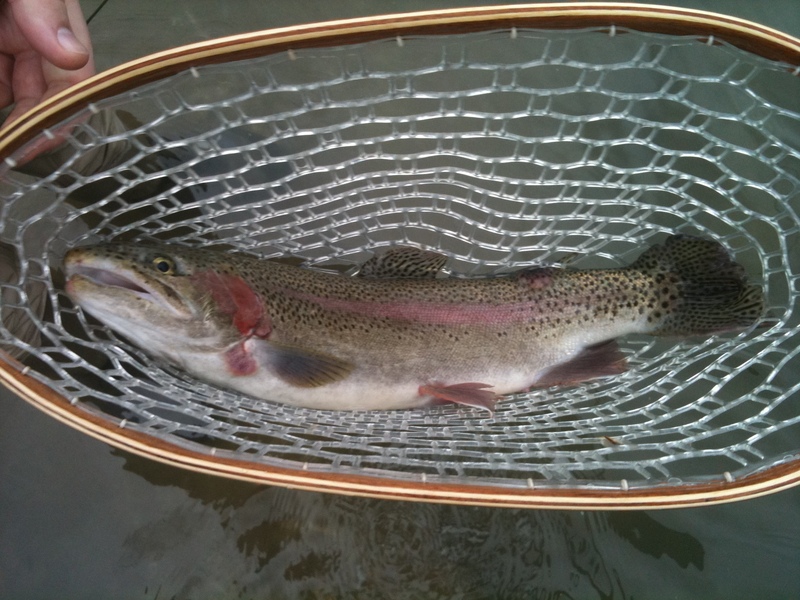 The weather was dreary, cloudy, a front about to blow in with some rain, and the fish were still all morning. No one on the river was catching much, until about 11 AM. A guy fishing with what appeared to be a deep diving “bass imitation” (read grean lure) hooked up with the first trout that we saw. About 15 inches. A few minutes later, using a similar yet branded (RAPALA) deep diving Shad Rap, also Bass imitation design, pulled in what we like to call a ‘slab’. 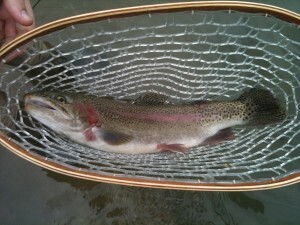 It was the first time on that river I have caught a keeper trout- over 18 inches. And unfortunately no pictures. It flopped out of the net and busted the line. And made off with the last deep diver I had. I had a mid and a shallow, and unfortunately, neither of those drag the bottom in the deeper water, which is apparently the best way to catch a trout in the Guadalupe–silver shad rap casted down river, reeled up river, dragging the bottom. Luckily, this started a small little spree of fish. 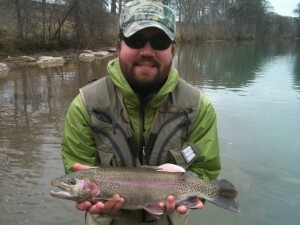 My brother pictured here catching the next trout on his fly rod. I believe a black mid sized wooly booger. I went on down river fishing to have a slow afternoon, and my brother caught a few more. Our friend Kenneth, who accompanied us after a previous day of duck hunting in El Campo, was on his first Trout Expedition. Also, his first Guadalupe River Fishing Trip. 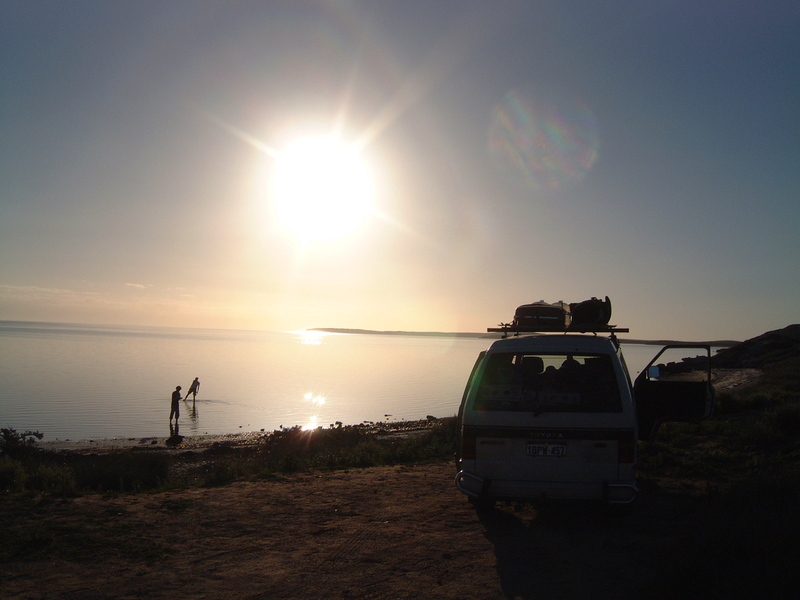 A little over seven years ago, I spent two months living out of a mini van driving around Australia. I started my journey on the West Coast in one of the most remote cities on earth – Perth – and drove myself and a few other people for part of the route all the way around the North and East coast to Sydney. No daily plan and an ultimate sense of freedom. Just a starting point and an ending point, letting the days decide which path my adventure would take me, living in the outback amongst some of the most poisonous creatures on the planet. Living like a hippy with not a single care in the world. As I was driving down parts of the East Coast, I distinctly remember seeing kitesurfers for the first time in the distance. As the floating shapes high in the air above the water in the distance started to come into focus, many thoughts ran through my mind. First of all, “what kind of a genius invented this sport?!?”. 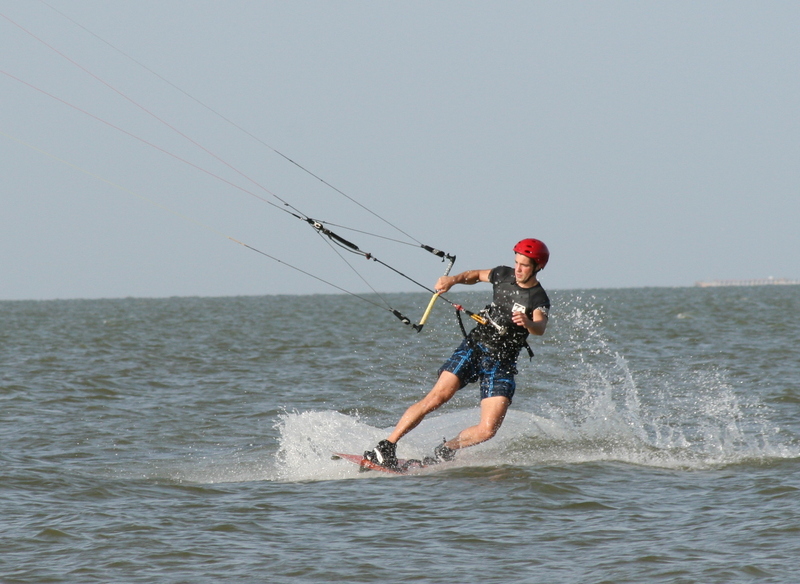 Secondly: “in my lifetime, I will learn how to kitesurf!”. As I reached the beach, I was taken aback by how the small human figures in the distance seemed to have perfect control of the massive kites, going upwind, riding waves, getting huge air. This sport was meant for me. Seven years later, here I am, checking the wind reports everyday to figure out when I can get on the water next. I have now been kitesurfing for a little under two years, and I have to say that I have been hooked ever since riding the water for the first time. Living less than an hour’s drive from the Texas Coast, I can go anytime the wind is decent, whether it is on the weekends or even after work in the summer when I am able to beat rush hour traffic. Call it an addiction. Yes, maybe. But until you try it, it is hard for anyone to understand the ultimate feeling of freedom that comes with controlling what waves you will ride, what direction you will go, how much air you will get, all powered by a natural force. Nothing like leaning back on your kite and digging the edge of your board into the water, creating a wall of water flying downwind, placing the kite exactly where you want it, picking up speed and jumping off of a wave, getting huge air and hanging there for a while, then gently floating back down to the surface of the water, for hours on end, all powered by the wind. No lifts, no fuel, no fees. Just you, your gear and the elements. To get started, I recommend buying a trainers kite and learning how to fly it really well. When you can do that, you are probably ready to have one of your experienced friends either teach you if they have a kite that they are willing to let you crash a few times. If not, a few hours of lessons is not a bad idea. After you are comfortable with body dragging, and dragging yourself upwind to practice getting back to your board, you are ready to hop on and surf. 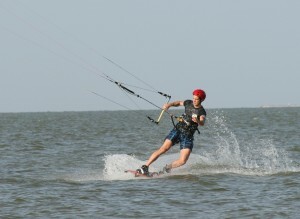 At first, you will most likely fall, have to walk back on the beach to get upwind, force drink water as your kite drags you downwind through the water, get your lines tangled as your kite falls out of the sky, and have someone have to go get your board as you are not able to get back to it. But once you quickly get past that, the sport becomes even more enjoyable. Not sure if the wind is good enough to kite? A good way to check is to pee right into the wind. If it lands on the ground, the wind is most likely not good enough. If it lands on your foot, a bigger kite / board is appropriate. If it lands on your knee, you’re in luck, break out the little ones. Or you could always buy a wind meter, whatever you prefer. No lifts, no fuel, no fees. No fees once you have your gear that is. And probably the number one thing that deters people from getting into the sport is the initial investment of your board, kite, lines, and harness. For beginners, I recommend buying a used kite – with no holes in the bladders or no major tears in the canopy if possible. You will save bundles of cash that way. But you will soon realize that you will want more than one kite so that you have all possible wind conditions covered, because when there is wind blowing, you will want to be on the water. This sport will become part of your life, and part of your reason for existence. You will catch yourself at the most random times subconsciously looking at all of the wind indicators around you, the flags blowing, the tops of the trees swaying, the windows rattling. You will start noticing some things that you never used to notice. And when you do finally get on the water, it is amazing, every time, no exceptions. The Sportsman Dispatch was created out of a pure passion for the outdoors, the people who love it, and the gear that facilitates that love. The Sportsman Dispatch is one solution to a disheartening realization. Our entire planet, and most of its wilderness, has already been discovered, and more than likely already been fished, hunted, filmed, climbed, categorized, rediscovered, hated, loved, forgotten, and remembered. With the exception of small corners and nooks of great expanses, the writers (and readers) of this publication will NOT be the first (and more than likely be the 25th in line of) people to cover a subject, write about a stream, or praise a certain species. Therefore, our writers must cover the discovered world in a way that connects with its reader base in an entirely different way. There IS something missing from sportsman pursuits these days, something this publication will focus on identifying. Whatever the type of fish, gun, gear, there is someone and 25 others who have devoted their lives to understanding every single aspect of that niche. These are the experts, the pro’s, the “rockstars”. But hunting and fishing did not start out as rockstar pursuits. Somewhere along down the line, these sports became technical, exclusive, and, intentionally or not, competitive. Such a progression is natural, once you discover how to catch a fish, you learn how to flyfish, then you learn how to catch a trout on fly, then a trout on the Guadelupe River on fly, then a trout on fly on the Guadalupe river in the rain… and as time goes on all sports like this naturally become technical. In contrast, this publication will be devoted to an unraveling of the exclusive/specialized web around most of these sports and present a different sort of passionate pursuit. Maintaining a healthy focus on the equipment and tactical necessities of our sports, and the obsessions they usually inspire, the Sportsman Dispatch will reflect an outdoor culture of decades past. What the editor and writers of this publication believe is that the sportsman pursuits are a lifestyle that is so natural, inclusive, and normal that they become part of every person who is exposed to them. They take shape whenever, wherever, in a Patagonia stream or county road creek, in the exact same way. These are lifetime fascinations that allow us to get together, learn about and work towards success at something, anything. Its both an obsession for the sport, and the practiced belief that what’s important is sharing it, having fun, and having it as a part of regular life. 100 years ago, someone went hunting with friends because they had some time off, it was that time of the year, they had an ordinary love of the outdoors, and wanted to go mess around for a while. I feel more connected to that idea than anything. I don’t count the number of bass I’ve caught, or the places I’ve been, but I do remember every fish and the lure it ate in every picture, because I was happy when I was there, and, just like I am a human, American, or coffee drinker, I am a fisherman. These “dispatches” will, together, build a resource to represent what we know is true. The day began with the breakfast bell ringing at 5 am. We were in the truck in no time and took the short ride down to Cove Harbor Marina in Rockport. By 6 :15 we were in the boat and ready to go. Little did we know the day would turn out to be one our best days catching Redfish. As my brother stated, “This was the greatest day catching reds ever and you never forget your first time or who it is with,” referring to limiting out of course. This was our 2nd trip on a guided bay trip and we were somewhat hesitant, not really knowing what to expect after our 1st trip 2 summers ago. We had a different guide this time, long time Rockport guide Todd Adams. 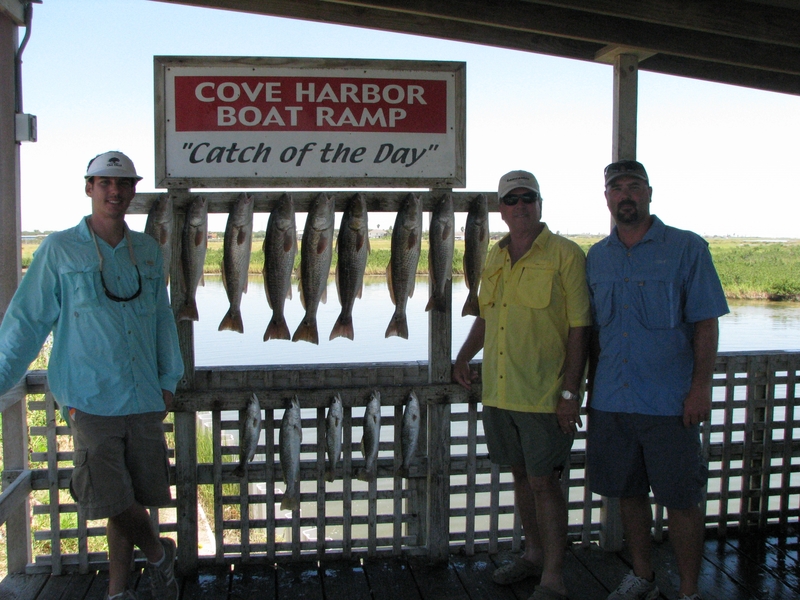 We have become accustomed to fishing various reefs and shorelines ranging from Carlos Bay down to Redfish bay. As Todd advised us, however, the trout fishing has gotten very inconsistent because of the recent tropical storms and heat. He said we may catch 5 trout or 25 trout. Our typical tactics were not going to get it done so we barreled (all 250 horse power) out of the marina across Estes Flats to the Lydian Channel. 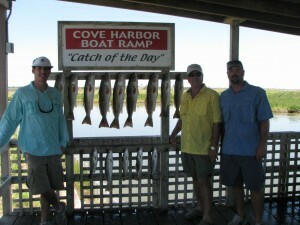 We began by fishing the inlets into Redfish bay off the channel by free lining piggy perch. Within 5 minutes, our dad had a nice one in the box. We thought we may have one of those big days. After several 14 inch trout, we decided we would move. We moved a few hundred yards down the channel, anchored and had another 4 in the box within a few minutes then we got a nice surprise. A group of kayakers paddled right by the boat to the inlet where we were casting. These guys paddled right in front us and stopped. We could have easily hooked one (and should have tried). We knew they were professionals when they were stomping around and throwing a bobber with about 6 feet of leader about 5 feet in front of them. We were sure they were going to limit out in no time so we left it to them. By mid morning, we had 5 trout and decided to go look for the Reds. Todd decided we would go sight cast for some reds before the Tide fell. Red fish have without fail been, caught at low tide. We were near the north side Hog Island, when we spotted a giant school of redfish, biggest school I had seen in nearly 3 years, likely several hundred. By the time we spotted them, we were right on top of them so they were spooked. We decided to loop back and trolled around for roughly an hour with no luck, Todd thought and they moved to deeper water. It was 11 am and we moved over to South Bay and tried to get set up before the “Rodeo” as we called it, began. The tide was slowly falling which is what we wanted. We were on the outside edge of the break, near some sand pockets. We spotted a few boats hooking up a single here or there but nothing major. Being on the edge, we were just out of casting reach of the schooling reds. By 11:30 the armada moved in and the boats began to line up, one right after the other, probably 15 across. Everyone was learning about the school of nice reds that were being caught in South Bay. It looked like bumper to bumper traffic in a major city. It was crazy, one person hooking up after the other. If you had a line in the water, you were going to land a 25” red, no doubt. It looked like dominos. Rods would begin bending on the boats to the west and would work down the line to the east. Some boats were handing rods to each other in order to keep the fish out of the other boats motor. Finally, one of the guides called Todd and said we could have his spot, so we trolled over and anchored. It was long until we had our first on the line, unfortunately, it got in the motor and broke off. Dad stated, he just lost his biggest Red ever. After about an hour, a broken dip net, and almost lost reel, we had our limit. We slowly moved out, and 2 other guides took our spot. As we moved a way, we watched and those boats took their turn. Quote of the Day: “Turn off your motor, your scaring the redfish D_ _ _ HEAD” (This was in reference to one of the guides yelling at a tourist, defined as anyone who is not a guide, trying to get into the action and coming a little too close). The day turned out exactly as Todd called it, Trout early, and then hammer the Reds when the TIDE falls. "..You never forget your first time or who it is with.." - Special thanks to the author of this story, John Henry (right), his brother Stephen (left), and their Dad for their contribution of this article and overall support of The Sportsman Dispatch. Gumbo: An “end of the season” recipe.. 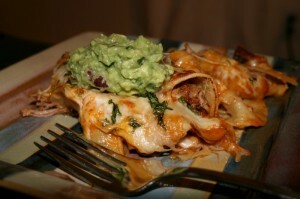 Anyone who hunts has found themselves with a hodgepodge of freezer bags of last year’s harvest. 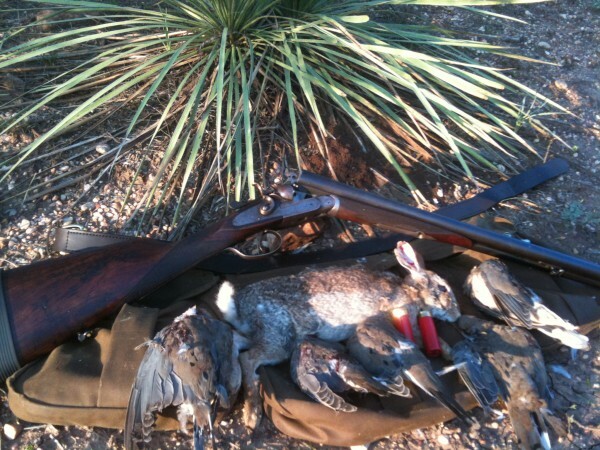 Whether it is that lone pheasant, that package with three quail in it, or those last two links of deer sausage, nobody wants to throw out game. 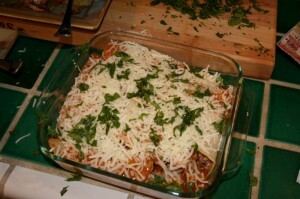 A few years ago my wife came across this recipe while playing Bunco one night. I have found it to work well with just about any kind of meat you can think of. Deer, shrimp, sausage, chicken, pheasant, rabbit, beef, quail, dove, squirrel. I usually have at least three different meats in the pot. On the smaller things like dove I cook them in a pressure cooker first and peel the meat off the bone. This meal can be eaten like a stew or it can be eaten like a gumbo served over rice. I call it a gumbo even though it does not have okra or a roux like traditional gumbo. A large pot of this concoction is just the right thing for a house full of people on a cold winter day watching football. I hope you enjoy it! Simmer butter, onions, celery, and all spices until soft. Add remaining ingredients. Bring to a rolling boil. Add Meat*. 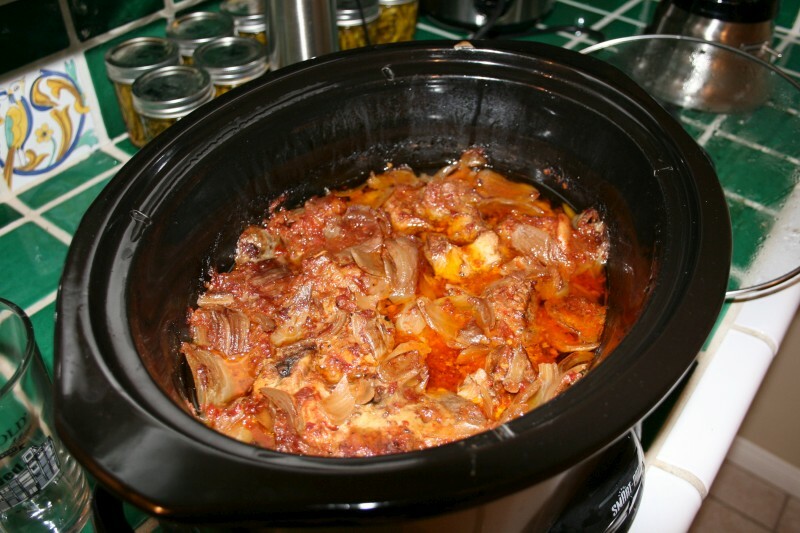 Cook on low heat until meat is tender, 30 minutes – 2 hours depending on meat. Add carrots, potatoes, jalapenos (if you want). Be careful with the jalapenos. This is already pretty spicy. Serve over rice or as a stew. *Use any meat you want. 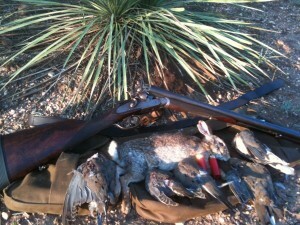 If you use dove or quail, you can boil them in a pressure cooker for about 3-5 minutes and the meat falls off the bone. Use chicken, sausage, shrimp, dove, quail, venison, beef, pheasant, pork, squirrel, etc….. Chicken, sausage, shrimp, pheasant, quail do not take long at all to cook. Beef, pork, venison take longer. Pressure cooked meat will be very done. If you cook it too long in the pot it will start to disintegrate into pieces. Add it at the last. Seasons other than Konriko work but none give it as good a flavor. Many, many years ago when my brother and I were bow hunting on the White River Refuge in Arkansas, we came upon a flock of wild turkeys foraging in the woods. We had grown up hunting ducks and doves and deer, but had no experience with these huge reptilian birds. We hunkered down and watched them scratching and pecking and meandering across the hillside. They seemed like mythical creatures: 20 pound birds with coppery feathers, long serpentine necks, able to fly like quail, run like racehorses, and see like eagles. We were pretty much transfixed. 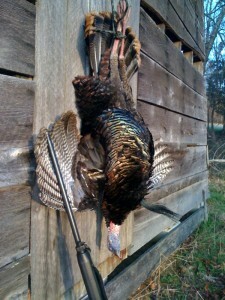 We bought turkey calls and went back the following April with shotguns. On a dark logging road, we split up, having no idea where the birds might be. He went one way, I went the other. He sat down in one spot, scraped his box call a few times, and some minutes later a jake and gobbler walked up. He managed to shoot the jake. All I found was a pile of feathers where a bobcat or coyote had dined on a turkey. We went back the next morning, and he shot another one. Again, I saw nothing. As Jimmy Carter said, life is unfair. First of all, learn to use at least two different types of calls. For reasons known only to the birds, some days one will work better than another. When I set up, I like to have a diaphragm call in my mouth, and start calling with a slate call. If the slate doesn’t get a response, I try the diaphragm, then a box call. When a gob gets close, you can use the diaphragm without moving your hands. Go to the source. There are lots of instructional tapes and websites with turkey sounds, but the best way to learn is to spend time around real birds. If at all possible, get out and find a flock of wild turkeys and get close enough to hear them well. Pay attention to the pitch and cadence of their sounds, not just vocal sounds, but all the noises they make: scratching leaves, wings flapping, all of it. If you can’t get among wild birds, find some tame turkeys and imitate their sounds.